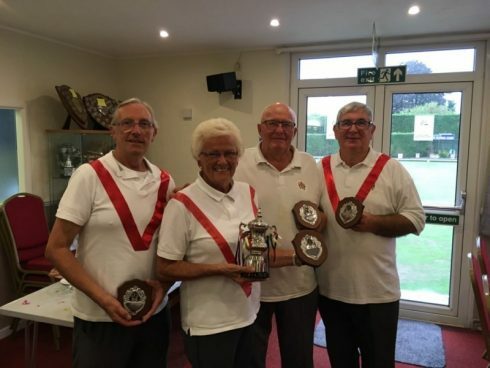 Sunday 12th August saw the playing of the Frank Etherington Memorial Trophy at Highworth Bowls Club and played with a nod to two of Frank’s passions, namely bowls and soccer. The competition is open to clubs around Swindon and beyond, as well as Highworth’s own social members, and involves teams of four players, named after football clubs and wearing that team’s colours on the green. Whilst the weather could certainly have been much kinder this year it did not prevent the event from being fulfilled and enjoyed. A really good fun day for all participants with catering provided and cooked by Frank’s family and a big thank you to them for all their efforts in organizing the event. In the midst of the competition, as well as honouring Frank’s memory, the aim of the Etherington family is to raise money for the Brighter Futures charity. Monies raised this year totalled £400, so a huge thanks to all who contributed.